Polar FT1 heart rate monitor is a basic heart rate monitor. 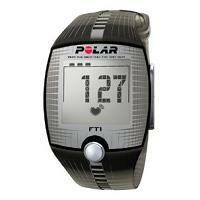 It is the entry-level model in the new Polar FT series for fitness and cross training. Continuous heart rate monitoring: You can check your real time heart rate on the wrist watch. Manual heart rate zone: You can set your upper and lower training limits (with alarm). The alarm sounds when you are not exercising within the heart rate limits. There is also a visual display on the wrist watch to inform you whether you are training above, within or below your heart rate limits. One button functionality: easy to use and operate. Stop watch. Visual training time indicators inform you at a glance how long you have been training. HeartTouch: During training, you can turn change the information displayed (Heart Rate/Duration/Time) on the wrist watch by simply bringing the wrist watch close to the chest belt. So you don't have to press any button to do that. Wireless heart rate monitor: It consists of a coded chest strap transmitter and a wrist watch receiver. Coded transmission prevents interference and cross-talk. The Polar FT1 heart rate monitor is great for those new to heart rate monitoring and recreational exercisers. It has a large and easy-to-read display and it requires only one button to operate. Things don't get simpler than this. It offers you heart rate training limits so you can make sure that you train safely and at the right intensity. Furthermore, after you have finished, you can review your average heart rate to see how hard you have been training in your last workout. In addition coded transmission avoids cross talk with other heart rate monitor users. All in all, it is simple to use, and offers probably just enough training data for new heart rate monitor users. The next model up in the FT series is the Polar FT2.